Yesterday we had no more snow on the ground. Just old green/brown looking grass out front. 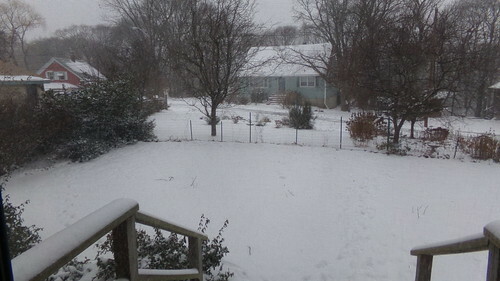 Oh yeah… the snow has arrived. I’d say we have about 2-3 inches on the ground. 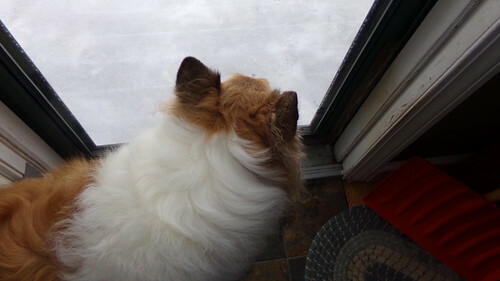 It’s a dry fluffy snow and is blowing around a lot with the winds – the perfect kind if you MUST have snow – mainly because of the shoveling factor. It’s a lot easier for geezer-men and, as the case may be, geezer ladies to do the shoveling. We don’t do snow blowers here. Not at this house. There are a couple of them living at other houses in the neighborhood, but we don’t much enjoy the noise from them, or the ensuing pollution. However, that said, our lovely neighbor, Bob, will come over with his snow blower and knock out the stubborn snow pile in front of our driveway for us, and for others, so we can’t complain about that generosity, now can we? The guy next door to us usually likes loud motor-driven equipment of all kinds, including mulchers (which are the worst!) and snowblowers. Lately, however, I have noticed him manually shoveling his areas so I have to wonder if his snowblower is working. I hope not! The sound of manual snow shoveling is music to my ears! Not so much, in fact not at all, the sound of a gas or electric operated snow blowing machine. We’ve got the heat on in here, it’s warm enough but I still need a blanket on my lap sitting in my chair. So let the winter unfold… it’s all downhill from here (now that I’ve said that, I’ll probably regret it!). My boy, Kip, never seems to be on the right side of this door! He does love the snow, not only for romping in but also for munching on. Another wonderful post. As I type with my catch-up reading (1/4/14), I believe you are again buried with record breaking snowfall? Leaf blowers are the bane of civility. I can’t recall the last time I heard a snow blowers (if ever) because I lived in California for 20 years and I now I live in a remote area with no neighbors. My fondness for lawnmowers harkens to days of my youth for some reason – and the heady aroma of fresh cut grass. I like your dog sayings! I am in PA and we’ve got nice, cold snow here. I get very tired of the drippy, grey weather. Bitter cold is a vast improvement! Funny Karen should mention about lawn mower noise. Actually, the sound of a distant lawn mower is one of my fondest memories from my teen years. To me, that means it’s summer. OTOH, I would gladly pull the guts out of any leaf blower. Those things are waaaaaay too loud. I love your photos of Kip by the door and the outdoors. I remember Dad doing a lot of shoveling snow by hand but then he got a snow blower. He was one of those who went around to the neighbors and helped them out. Around here, the landscapers and lawn maintenance guys use the leaf blowers. Although they do stop blowing when I get to their area but I still have to cover my nose until I am way past them. I love your dog quotes. They are so true. But then, the same could be said of cats. I don’t know what I would do without my Bailey. Notify worked 🙂 Have no snow stories. Here in the desert we have sun and 70’s. Would send some to all of you if I could. Some communities around here are forbidding the leaf-blowers now, too. They are awful on the ears. 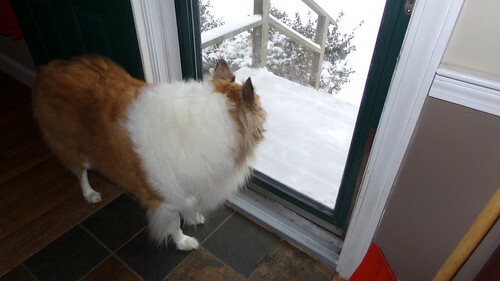 wow…lot of snow for you ..we had plenty on new years day…must of left us and came to your place. We have a snow blower for my old geezer, and I don’t mind them as much as the lawn tractors etc. when doors and windows are open. I was just saying(says she who can’t cut the grass), that I sometimes long for the days of childhood and the push mowers. We all agreed that kids don’t shovel snow anymore for some extra money. I guess they are in playing video games etc. and or have no work ethic. We haven’t got much here yet. The good news is that we found someone who will remove it (for a reasonable fee), so that the physically challenged can get out to work. Personally, I am going no farther than the bottom of the stairs. We have about 1.5 feet of snow at our place right now, and they’re forecasting that we’ll get about another inch from the back end of the storm that’s going to be hitting you for the next day or so. After that goes through then we might get more snow, from lake effect. Lake effect is responsible for much more snow here than what we get from snow storms. The last few years I’ve thought of getting DH a snowblower. He shovels snow by hand right now but as we’re getting older he’s much more likely to have very sore muscles for days on end afterwards, when there’s a lot of shoveling. And DH isn’t exactly in poor shape as he walks miles per day with the dogs, though I’m sure that as active as Paul is with his lobstering that Paul is in much better shape than my DH. Maggie, yes… “somebody” does, indeed enjoy it… two “somebodies” in fact, because Emmalee loves to eat the snow even more than Kip does. She makes a regular meal out of it! When there was hardly any snow left on the ground earlier this week, only a couple of old patches of old snow/ice, she would go straight to them and munch away like a cow out in the field… I don’t see the attraction myself… we have 4 water dishes in this house for them and keep them filled. Dogs! I got a good belly laugh thinking of Kip being always on the wrong side of the door! At least somebody enjoys the snow!